Hi lovely readers! As I promised, I will held something for my 1st Blogversarry. This time I will pick 3 winners! 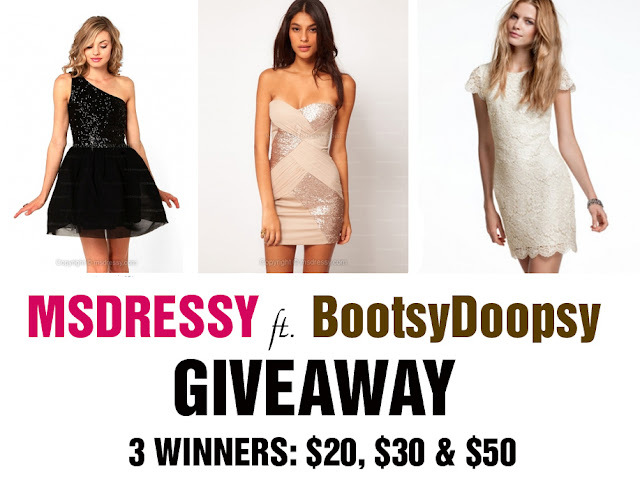 1st winner will get $50 voucher, 2nd will get $30 voucher, and the 3rd winner will get $20. 2. Like BootsyDoopsy facebook page HERE. 3. Like MsDressy facebook page HERE. 3. Follow my twitter HERE. 4. Follow my Instagram acc here if you have their account. 5. Leave a comment bellow, your GFC name and your email address. Dont't forget to write your email, because I'll contact the winner via email. This Giveaway start Feb 6th and close on Feb 12th, only 1 week, so make sure you have join! And here is the winner of my previous giveaway, congratulations dear! Such a lovely giveaway! !Happy Thursday dear! OMG!! I cannot believe I won!! Thank you so much!!! !